Microsoft has implemented a sophisticated set of features for managing the sales cycle within CRM. The basic premise is that a large number of unqualified leads are subjected to a series of marketing campaigns and workflow activities until the point where they qualify as a sales opportunity. At this point, the original lead record is qualified and promoted by converting it to a customer record (an account and/or contact) with an associated opportunity record. Opportunities relate to a customer record, which can be either an account or a contact record depending on the nature of the business. Potential new business for an existing customer or prospect is recorded by creating a new opportunity against the customer record. Information on the products that interest the prospect are stored against the opportunity together with a value and estimated close date for the deal. Products and prices are maintained in the product catalog (see the Products section) and the users can set the pricing for each item or let the system calculate pricing. The products held against an opportunity are carried through the sales process as the opportunity is converted into a quotation, then an order, and finally an invoice. Discounts and write-in products (that are not picked from the product catalog) can be added from the quotation stage onwards (together with sales tax) and freight costs can be added at the order stage. Sophisticated sales workflow involving a series of pipeline phases can be defined against the opportunity to ensure that the sales pipeline is progressing smoothly. These phases are created with workflow and are similar to workflow stages (see the section on workflow). · A lead is an unqualified marketing contact. · An opportunity is a qualified sales opportunity associated with a potential customer together with associated products. · An account represents the company details for a potential customer. · A contact represents the contact details of a company but may also be a customer for consumer sales. · Opportunitieshave associated products with pricing taken from an appropriate price list and perhaps have a discount applied. · Quotations are created with associated product items against a customer usually by converting an opportunity. A quotation can have user pricing to override the product pricelist pricing and also write-in products that are not attached to any record in the product catalog. Discounts and freight can also be applied here..
· Orders and associated products are usually created by converting an active quotation. · Invoices can be created by converting an order although many CRM implementations leave invoices to be extracted from the accounting system. Activitiesand workflow can be defined against any of these entities although CRM is designed to use the opportunity sales pipeline for monitoring and progressing the sales cycle. One area of systems analysis for CRM installations is the determination of the best practice for storing notes and activities consistently against the different entities associated with each potential sale. Note: Some organisations do not require the opportunity phase in the sales cycle and progress directly from a lead to a completed sale. The value of the pipeline phase for each opportunity is often used in conjunction with the expected date, value, and probability to drive the sales pipeline reports. See the workflow section for a description of how this can be automated. Leads represent contacts at a stage before they become serious sales prospects. Leads can be created in CRM from a text file using the bulk import facility and associated with a marketing list. The bulk import feature is discussed in the chapter on data management. A quick campaign (see the marketing chapter) can rapidly create activities for organising sales activities such as scheduling outbound phone calls or emails or sales literature fulfilment via a mail merge. At some point the status of the lead is updated and the lead may be promoted to an opportunity at which point an associated customer (account or contact or both) record is created and the lead is deactivated and made read-only. Note: Deactivated leads can be reactivated from the actions menu. There are several predefined fields in the default CRM database used for profiling leads, including annual revenue,industry type and lead source. New attributes can easily be added to the lead entity and the validation set so that values must be entered by the user when a new lead is created. This can help in analysing the success of marketing efforts and is recommended practice. Note: You should make sure that your system customiser defines mappings for additional fields created for a lead so that these values are copied automatically to the appropriate contact or account entity when the lead is qualified and the new records created. 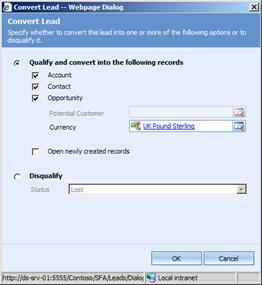 Leads are converted to Opportunities (or disqualified) using the Convert Lead button on the form menu. The lead can be converted to the corresponding new account, contact and opportunity records or converted to a new opportunity against an existing customer record. Qualifiedleads are deactivated (made read-only) in the database and converted to the corresponding customer and opportunity records. A link to the original lead is available from the opportunity entity to trace back over the history if required. Leads that fail to progress through to the sales pipeline can be disqualified rather than deleted. This means that the data is available for analysis later. Opportunities are integral to monitoring the sales pipeline and represent a business opportunity with a customer or a prospect (either an account or a contact record). Leads must be converted to an opportunity before they are considered part of the sales pipeline. Note: Some users of sales and marketing systems such as Act! And Goldmine find it difficult to move from one view of data to having data stored for a single prospect in the lead, account, contact, and opportunity entities (not to mention the related activities). The key fields for the opportunity are the potential customer, the currency, and the pricelist. Each user has a default currency which is set into the lead initially and is carried through to the customer and opportunity when the lead is converted. The currency cannot be changed once the opportunity has been created and determines the available pricelists that can be selected. Note: New opportunities are created for existing customers to represent a new piece of potential business. Once the price list has been specified, products may be added to the opportunity to reflect the interests of the potential customer. The individual products linked to an opportunity must come from a product price list item. Prices are specified for each product against a pricelist (for each currency) and a base unit which must be specified together with the quantity and price. The options to alter prices and add discounts depend on the specification of the product and the user's security settings. Note: Write-in products that do not derive from the price lists and discounts can be added at the quotation stage. Prices are automatically calculated for system calculated opportunities which will automatically reflect any price changes made to the product price list items when the recalculate option is selected. User provided prices can be set if the user has the appropriate security permissions and should be used when a firm price is given to the customer as they do not change automatically when recalculated. Note: Clicking on the product hyperlink will bring up the relevant product form which shows the standard retail and cost prices and links through to competitor and sales literature information as well as all the price list items for that product. The sales pipeline value is determined by the probability and the estimated revenue and close date and is an important management figure. Pipeline phases (see the workflow section) can be specified to monitor the sales process by automatically assigning a probability at different stages to reflect the business processes surrounding the sales pipeline. 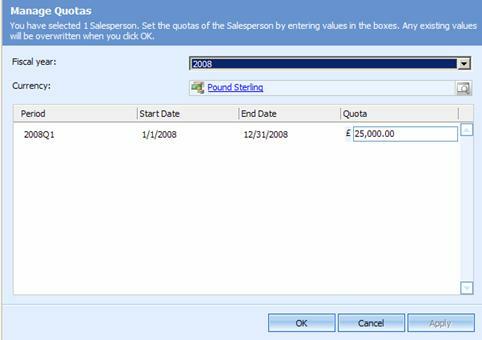 A new quotation is made by selecting the quotations pane from the opportunity record and creating a new quotation. This automatically copies the products already associated with the opportunity into the quotation. A discount percentage and freight charges can be added at this stage if required. The expected delivery dates and the shipping and invoice addresses are set in the shipping and addresses tabs of the form. The pricing information stored against the quotation products can be changed and write-in products added that do not use the existing product codes or pricelists. You can specify the override price option to set your own price for a product item so that it is not changed (when the price is recalculated) because of a change to the product price list item. Once the Quotation is complete you should use the option on the Actions menu to Activate Quote. 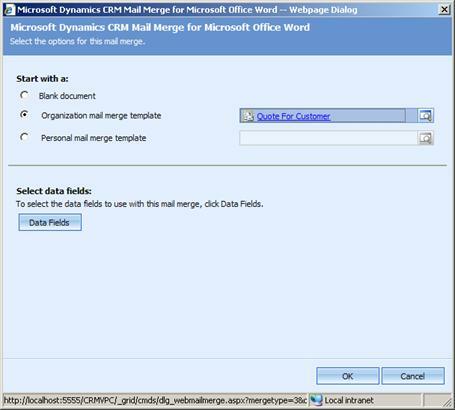 Use the Print Quote for Customer button to merge the quotation to Word, by means of your quotation Word template which can be stored in CRM. You can then distribute the document to the prospect (remembering to append a copy of the document as a file attached to the quotation in the notes field). Additional options on the Actions menu allow you to get products, perhaps from an opportunity created for another customer, or lookup addresses to specify the delivery and invoice addresses. A version number is applied to each Quotation and best practice is to activate the quotation before sending to the prospect. Select the revise quote option from the Actions if you need to modify an existing quote and note that the revision ID for the quotation has been incremented. 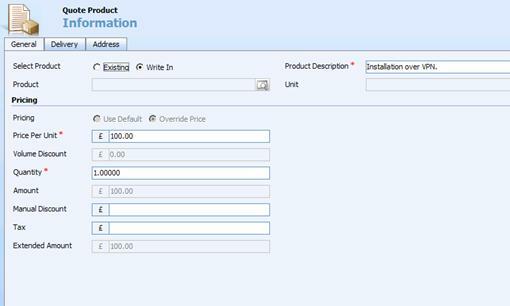 The actions menu provides the create order option to convert the Quotation to an order (the quotation must be activated before it can be converted) if the quotation is accepted by the customer. On the other hand, if the quotation is not accepted, use the close quote option to indicate that the sale has been lost and indicate the appropriate reasons. Orders have functionality similar to that of Quotations and allow modification of the final order information if required. The action menu is used to fulfil an order when it is complete and needs to be dispatched to the customer. Alternatively, the order might be cancelled (and the appropriate reason entered) or simply deleted. Other options available for an order include looking up addresses and recalculating or using the current product pricing from the appropriate pricelists. 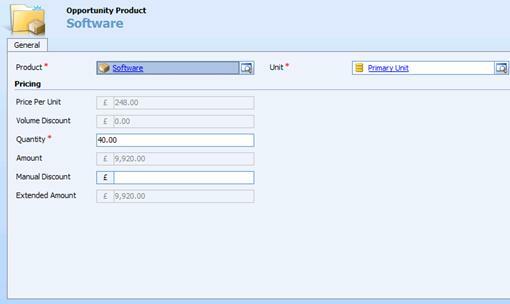 Finally, an Invoice can be created from the fulfilled Order record. 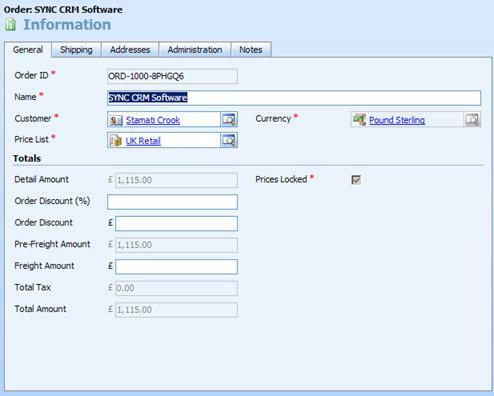 Some of the accounts integration products stop invoices from being created within CRM and take completed orders to add into the accounting package and then copy the invoices back into CRM. 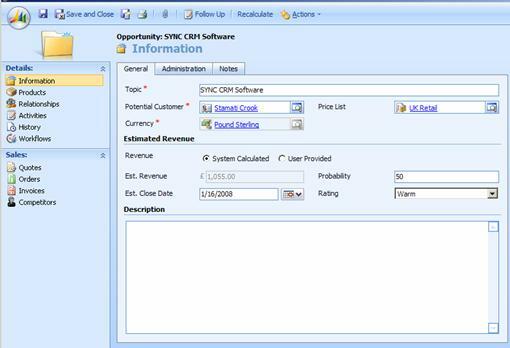 Note: The author has such software available for Sage and QuickBooks at http://www.redware.com/mscrm and Microsoft have their own offering for Dynamics accounting software. Invoices allow recalculation of the pricing information using the latest product pricing and can be cancelled or deleted. 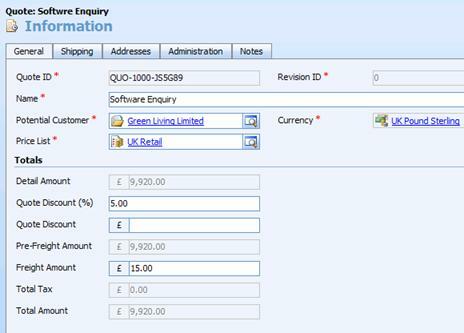 The actions menu allows the status to change to Invoice Paid which completes the Invoice so that it can no longer be updated. Note: Many installations make invoices read-only and use their accounting system as the source of invoicing data. Take some care if you use invoices as multiple Invoices can be created from a single order. You may need to print invoices with a custom report and remember that Invoices should not be updatable once they have been dispatched to the customer. Each user and customer has a default currency and all monetary values are stored against a specified currency together with a calculation of the amount in the system base currency. Currencies are maintained in the settings-business management-currencies area and allow an exchange rate to be entered against the base currency. The current figures can be maintained by uploading a file of the latest currency rates. Only the current prices are maintained and it is important to understand that the base currency values stored against each currency amount are recalculated only when any money field on a record is changed or the status for that record is changed. Note: The base currency for the installation is set during the installation process but the system customiser can change the name and symbol of the base currency. · Subject. A hierarchy of subjects is defined in the settings-business management-subjects area to allow a consistent hierarchy to be applied for organising products and sales literature. · Competitors. Competitors can be defined in the sales-competitors area with links to the products they supply and notes on their strengths and weaknesses. · Sales Literature. A set of documents can be uploaded into the sales-sales literature area and tracked against products and competitors. An abstract and keywords help in searching for the required literature where there are many related products involved. Sales Territories can be defined and allocated against each customer. Territories are created in the system-business management-sales territories area and have a manager and a number of member users. Each Customer can be assigned to a particular Territory allowing sales pipeline analysis by territory (and territory manager). The sales pipeline is an essential tool for sales and marketing management and shows the predicted level of orders currently coming through the sales process. Sales pipeline reports (from the workplace-reports pane) use the opportunity data (comprising the probability, estimated value and estimated close date) to predict sales forecasts against the salesperson, business unit, territory and so on. Take a look at other reports regarding the sales pipeline including the Sales History, Sales Pipeline and Neglected Leads reports. 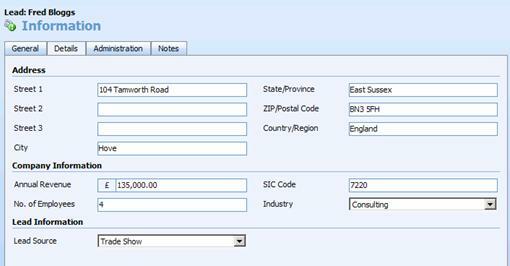 Sales quotas can be set against each user from the actions-manage quotas option of the user form. This option only appears after the fiscal year has been defined for the CRM installation. Note: The fiscal year settings cannot be changed once they have been set so take great care to decide if you want monthly, quarterly, or annual sales quotas and take a backup before setting this value into the system. Sales quotas are entered by selecting the fiscal period and currency and simply entering the sales targets for each user. These are then used in the pipeline reports.